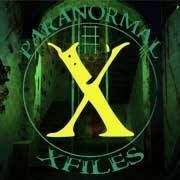 Home Paranormal New Zealand Ngatea Mystery Circle – Terrestrial or Extraterrestrial? 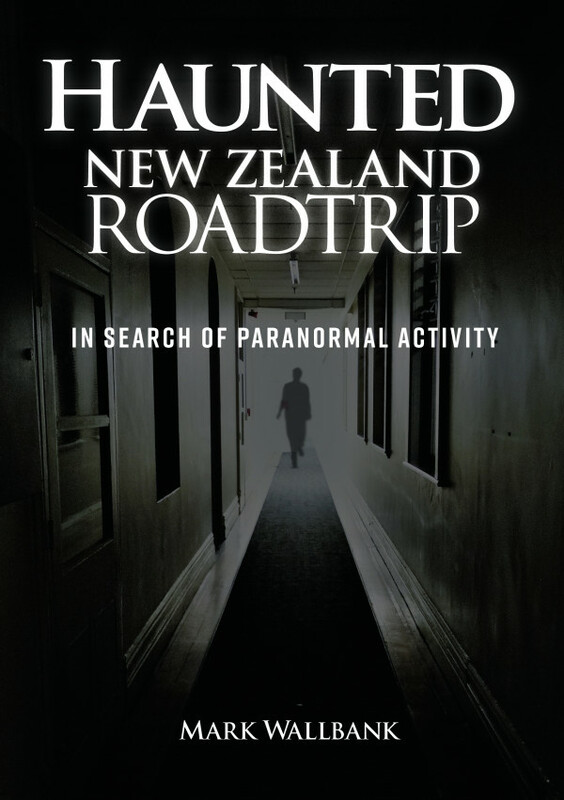 From the original script by the late Harold H. Fulton It began quietly enough early in September 1969, but before two months were up, New Zealand’s biggest space scare had boomed to the greatest public UFO awareness on record in this far southern land’s experience. 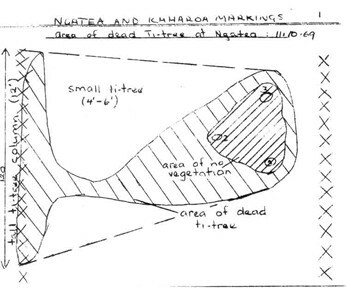 For a period commencing mid-September for the following four to five weeks there was hardly a day when the press, radio or TV (in that order) failed to mention new ‘circle’ discoveries, and particularly conflicting findings and opinions of investigators as to the cause of the ‘Ngatea Mystery Circle’. The enigmatic trail-blazer came when the press and radio in Hamilton learned details of farmer B.G. O’Neil’s discovery. On September 4 Mr Bert O’Neil had discovered a strangely affected patch of manuka (known locally as ti-tree or scrub-weed) on a run-off section of his farm. This seldom-visited place was covered with the plant. He had first noticed, from afar, a very bleached patch among the taller ti-tree growths that bound the area. This was three weeks earlier, but on September 4, he made an on-the-spot investigation in company with a local ‘scrub’ contractor and made a major discovery. Before his startled eyes, Mr O’Neil saw a circular patch of dead and silvery-white manuka in the midst of otherwise green and lush growth. 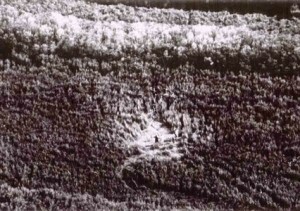 Aerial photo of the Ngatea Mystery Circle some months after its mysterious appearance. Within the circle, an even more interesting find was made. 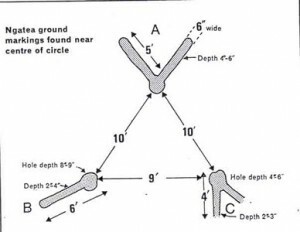 An inspection revealed, near the centre of the circle, three very unusual ground indentations, positioned so as to form the inside points of a triangle. Off to one side of this (scorched?) circle was the taller stand of ti-tree, also bleached and dead. This was the spot that Mr O’Neil had sighted earlier and which had aroused his curiosity. He noted too that the dead scrub-weed within the circle was all still standing and undisturbed. As to what had killed the flora, that was quite a poser. Mr O’Neil knew there had been no spraying of weed-killer from the air or ground on either his or nearby farms. In fact, he had not even visited this part of the property for some six months. He was certain too, in his own mind that the general appearance of the dead scrub was totally unlike the expected effects of weed-killer, which causes a twisting of the stems. As to the strange ground indentations, they were very different from those made by rooting pigs and anyway, there were no wild pigs on the farm. As he stood to survey the whole strange scene, it looked to Mr O’Neil as if some large object had come down from the sky and landed on three long stilts. 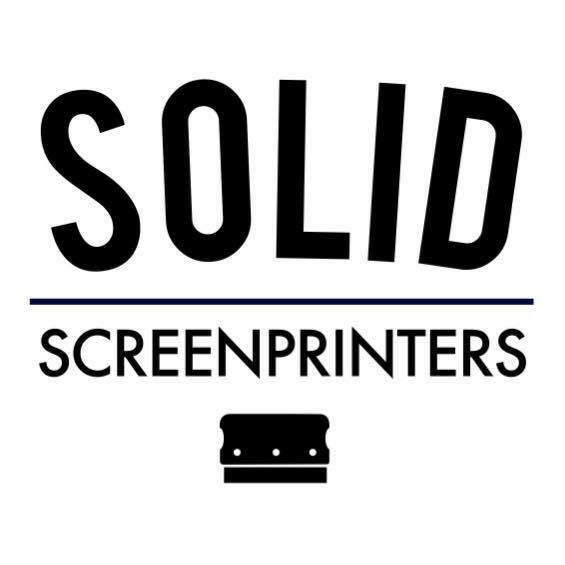 Its footpads could have made the evenly spaced earth indentations. Somehow the scrub-weed within the circle and the nearby taller stand of 15 feet could have been killed by the object. He had read a little about UFO sightings and recalled how a mysterious circle of dead flora had been discovered in Australia in 1968. Although Mr O’Neil at first only discussed his strange find within the family, the news quickly leaked to the local radio and press. Then the rush to see and to collect souvenirs began in earnest. 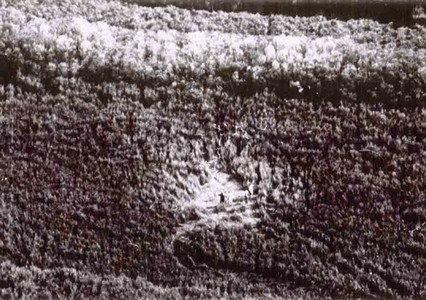 Luckily a handful of regular UFO investigators were on the scene by Sunday, September 7, but already the area was much trampled; a lot of scrub-weed within the circle had been removed and the ground markings disturbed. The condition of the site was very different from its original appearance when, nearly five weeks later, scientists from the Department of Scientific and Industrial Research (DSIR) and Victoria University of Wellington arrived at Ngatea. Among the researchers from private organizations were four members of the Auckland University UFO Research Group (formed by Tony Brunt and fellow students in December 1968), Tauranga representatives of the Auckland-based New Zealand Scientific Space Research (begun by Henk and Brenda Hinfelaar in 1959), and the Timaru-based Scientific Approach to Cosmic Understanding. The University team described (in part) the area. Quoting from their September Newsletter: “The ti-tree in the 56ft circle was dead and still standing. It was dry and white in colour. The burn was uniform down the stem and was obviously not a heat burn. It did not appear to be the work of a weed-killer or any normal defoliant. The burns were reminiscent of radiation burns. Not quite in the middle of the burnt circle were three depressions which looked equidistant. The measurement showed that the three sides of the imaginary triangle were, in fact, 10ft, 10ft, and 9ft. 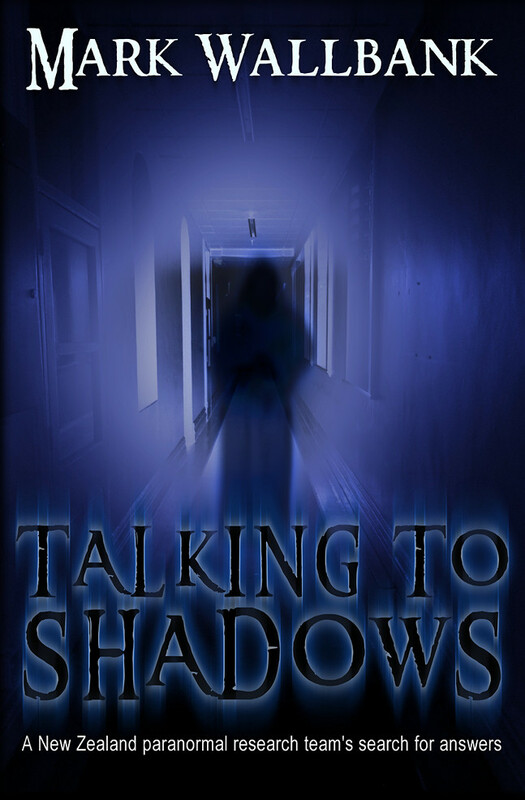 The vague depressions were about two feet across and about eight inches deep. From two of the depressions, two furrows forming a v-shape radiated out a few feet. With the publication of a five-column-width feature story syndicated on the Ngatea incident by several newspapers throughout New Zealand, public interest caught on and caused the first stirs within official confines. The story was headlined: IS MARS NOW TAKING A LOOK AT US? The Wellington Evening Post of September 10 carried the feature; Wellington Victoria University staff had noted it; but when a leading horticulturalist, Mr Stuart-Menzies of Te Puna (near Tauranga) released to the press the results of his examinations of samples taken from the Ngatea Mystery Circle, things really began to pop. According to Mr Stuart-Menzies, the scrub-weed within the affected area had been killed by high-frequency short-wave radiation. Mr Stuart-Menzies had been called in to examine samples by Mr Harvey Cooke of Tauranga. Damage to upper end of ti-tree branches from possible radiation. It was now early October and ‘mystery circles’ were being reported from other areas in the North Island, but more notable was the fact that real interest had penetrated official enclaves. First off the mark was an authorized team of four from Wellington’s Victoria University, led by Dr N. F. Barber, Professor of Theoretical Physics. These gentlemen were closely followed by members of the DSIR, sent into the arena by the Minister of Science, Mr Brian E. Talboys. Wellington’s provincial morning paper, The Dominion, has given a day-by-day, blow-by-blow discourse on the Ngatea incident on its front page commencing early October. The Minister of Science apparently was unable to avoid the issue. Wellington is the seat of government and a major election platform was just swinging into real action. The election date was November 29. The moment official interest became directly involved, simple and rational explanations for all mysteries were rapidly forthcoming. It was almost as though an order had gone out to kill off the UFO landing theory as quickly as possible. The official explanations ranged from the possible to the unlikely to the utterly ridiculous. They came in a fast flow from TV., radio, and press, now in the reverse order of priority to that given at the beginning of this account. Some examples of the official explanations: the scrub-weed had been sprayed by aircraft, from a tractor, by duck-shooters; the ground indentations had been made by rooting pigs, by rabbits, and removed fallen ti-tree stems pulled from the soft peat soil. Mr Bert G. O’Neil, a seasoned farmer and owner of the property, had eliminated the above explanations on his first examination and he had been quoted accordingly in the nationally syndicated article of September 10. All non-official investigators and visiting farm friends were inclined to agree with Mr O’Neil. Researchers view the size of the mysterious circle. I also wrote to Mr L. J. Mathews, a scientist at Ruakura Soil Research Station, Hamilton, who had assisted in the above investigation. In reply, he quoted from his memo to Mr Vance Neall. Mr Talboys concluded there was nothing abnormal about the dead patch of manuka, and that normal causes of death should be considered before worrying about possible extraterrestrial phenomena. He said he did not consider that the matter warranted further investigation. 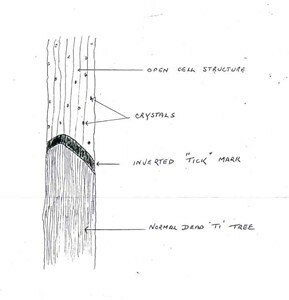 Sketch showing the extent of the patch of dead manuka. The report was immediately challenged by private investigating groups and their expert consultants, among them, Mr Stuart-Menzies and Mr R. Chidnall (leading horticulturalists), and the Editors of a number of newspapers. In defence, Dr E.G. Bollard of the DSIR plant diseases division pointed out that the report to the Minister stated that saprophytic fungi were found on the manuka, but this was not given as the cause of death. He said he believed the Minister’s statement provided an adequate explanation. By this time, samples were being sent in by zealous citizens from other circle mystery finds, but the DSIR now released a press statement that they were refusing to carry out any further tests. In a press release dated October 14, Mr R.Chidnall joined Mr Stuart-Menzies in repudiating the Minister’s findings. Mr Chidnall said he agreed that saprophytic fungus was present, but this was a secondary state following death and did not explain how the plants died. When he examined the material he found “a set of states” which he could not fit into any ordinary pattern. Under the microscope, considerable differences were found in the dead wood from the affected area to that found in other areas. He also found that the soil from the circle would not support growth. “I sowed seeds in the soil which I collected from the affected area, and they sprouted and died within 48 hours 0- they just keeled over and died!” Seeds from the same packet planted in soil from outside the circle were still growing naturally, he said. Mr Stuart-Menzies agreed that he could see no evidence that the manuka was killed by spray or fungus. Saprophytic fungus lived only on dead material and did not kill. He added that Geiger counter readings taken within a week of the circle being discovered registered radiation in the thicker pieces of manuka. I have not mentioned the number of interesting UFO sightings made by the time the mystery circles were discovered. However, with at least nine different sites recorded there was not one instance of a UFO being seen to leave the roost, as was at Tully, Australia. On September 4, the day that Mr O’Neil discovered the circle, a UFO was tracked by radar for 100 miles and confirmed by two pilots aloft. 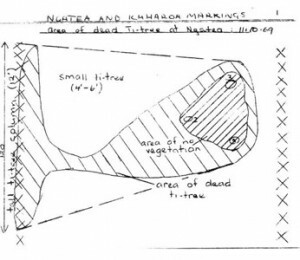 The evidence, however, from both private and official sources, is that the circle at Ngatea is most likely to have been caused 3-6 months earlier. Whatever the real cause of the Ngatea and other circles, they must surely have broken all records of coverage of a suspected UFO incident on press, radio and TV. 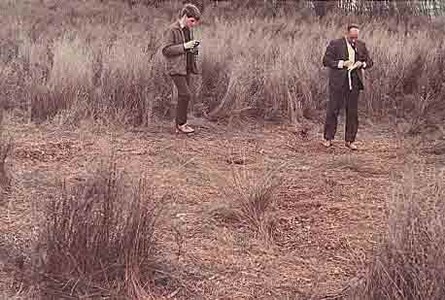 Researcher Harvey Cooke (right) inspecting the ground markings within the Ngatea Mystery Circle.